Dan Willard studied flute with Jane Powell at El Camino College. 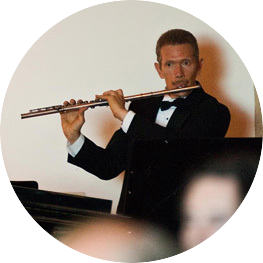 Dan has played flute for many wedding ceremonies and has a large and varied repertoire of classical, jazz, and popular selections. Dan has performed numerous musicals on flute including Annie, South Pacific, West Side Story, Kiss Me Kate, Cabaret, Carousel, My Fair Lady, Fiddler on the Roof, Sound of Music, The Pirates of Penzance, and The Music Man. Dan also plays flute in recordings of his own compositions. Dan continues to play flute in musicals, with his own jazz band, The Dan Willard Jazz Band, and his own big band, The Dan Willard Big Band. He teaches private flute lessons at Ojai Valley School, the Thacher School, and at his home in Oak View.